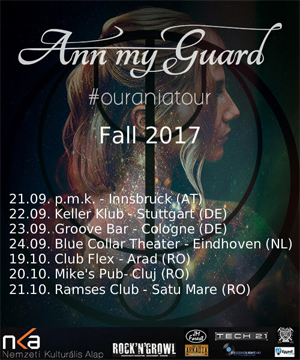 Hungarian female fronted metal band, ANN MY GUARD, have announced European tour dates for September/Otctober in support of their new album Ourania, which was releaded earlier this year. Singer Eszter Anna Baumann has to say: "ANN MY GUARD is very excited about hitting the road again and playing some gigs across the continent. On this mini fall tour, we are promoting our second album Ourania, which came out in the beginning of this year via Rock'N'Growl Records. Also, we are really proud of being invited to Female Metal Event, where we are playing a special acoustic show in Blue Collar Theater, Eindhoven. Inspired by this, we are going to film an acoustic live video session in November, before we will be ready for more tour dates, and recording our third album in 2018". ANN MY GUARD was formed in 2007 by singer-bassist Eszter Anna Baumann. Their first EP, Cinderella’s Syndrome was released in 2010. The second song from the EP, "Gone", was featured on an US promotional sampler Kill City Series. Their popularity in Hungary was fast grown by the broadcasting of a report within the Hungarian X Factor, in which ANN MY GUARD‘s lead singer Anna had been invited to introduce the band. In the summer of 2011 they recorded their second EP Doll Metal with rock producer Zoltan Varga at Supersize Recordings. ANN MY GUARD‘s first album Innocence Descent was released in April 2014, produced by Gabor Vari at Black Hole Sound. Beginning 2015 they started to work with UK-based indie label Shamanize Records. After additional mixing by Dark Moon Audio in the UK the album got mastered by Pete Maher for Shamanize Records. ANN MY GUARD was touring almost two months in Europe promoting the debut album. The second album entitled Ourania was released in January 13, 2017 via Rock’N’Growl Records.